My first introduction to the book, Teaching in the Connected Learning Classroom, was at the 2014 Urban Sites Conference in Chicago. As I made my way through the introduction in a break-out session, I recognized themes that resonated with discussions I have had with teachers about their experiences within the contexts of their classrooms, their ongoing adaptations to digital technologies, and their need to connect with other teachers around these topics. It was a natural fit to offer a space to take up these ideas at our local site, so I invited participants from the Minnesota Writing Project to join me in a book study around Teaching in the Connected Learning Classroom. After an email invitation, a group of us gathered to decide our goals and ways of connecting, online and in-person, around this text. As our discussions unfolded, we recognized that the content of the book and our interactions with it modeled our own beliefs about teaching and learning. The book club allowed us to do as the book suggests, entering into dialogue in order to “seek new pedagogical pathways forward,” (Cantrill, et al., 2014, p. 8) by providing a shared space for us to support each other, consider adaptations to ideas for our own contexts, and empower us to share our stories. “Perhaps more than any other component of a connected learning framework, the cultivation of academically oriented forms of engagement should, in principle, resonate most clearly with the familiar areas of teacher practice” (Cantrill, et al., 2014, p. 19). Through our book club, we were able to take the stories from Teaching in the Connected Learning Classroom and support each other in an exploration of what the concept of connected learning means for our own beliefs and ideas. As we reflected on the tensions that teachers feel between ongoing district and state demands and students’ needs, we were reminded of the importance of being part of a community of learners where we can connect our practices with theories of teaching and learning. Making our way through the chapters of the book, we often talked about the ways the different lessons required a strong community in a classroom before the other components of the lesson could happen. The support we felt for each other around the book acted as a mirror of what we hope to accomplish in our classrooms in order to support opportunities for connected learning. As a group of teachers who are continually looking for new ways to engage with students, the book provided a common ground for us to come together and support each other. “I improved as a teacher and a learner through lots of little exchanges, wonderings, posts about what was happening in my classroom, what I wanted to happen, and how to bridge the gap between the two states” (Cantrill et al., 2014, p. 71). As we reimagined ways of meeting students’ interests and providing opportunities for their production, we reflected on what we already do, what gets in the way of things we try to do, and how we can continue to build on those ideas. Reflecting together on the examples from the book allowed us to imagine “what is and what could be” (Lensmire, 2000, p. 49) in our own contexts. Our discussions led us to moments where some of the project examples seemed beyond the resources or parameters of our own settings, but we found ways to take parts of them and make them our own. At the same time, moments felt as if we were rediscovering our own beliefs about teaching and being reminded of why those beliefs are central to our teaching. In this way, the book felt like a relief, offering support for the ways we strive to bring student interests to the center of our teaching. “Nevertheless, I maintain that the power and possibility of tapping into students’ passions are undeniable, particularly for students who often feel invisible or marginalized in mainstream educational discourse” (Cantrill, et al., 2014, p. 10). Our discussions pointed to moments where we felt like our teaching is overwhelmed with educational policy, but we reminded each other of the knowledge, passions, and commitments that we bring to the classroom. Coming together around the book gave us time to reconsider the potential of our students and our own expertise as teachers. We were empowered through our collaboration to take up new ideas and bring them directly to our teaching contexts. We brought our experience to a larger group of teachers at our fall retreat which focused on the concepts of connected learning. With Paul Oh as a guest speaker from the National Writing Project, our local site spent a day exploring the ideas through a notebook hacking session and a reflection from our experiences as a book club. For both our students and ourselves, our support and time for reflection empowered our own ideas. Cantrill, C. Filipiak, D., Garcia, A., Hunt, B., Lee, C. Mirra, N., O’Donnell-Allen, C. Peppler, K. (2014). 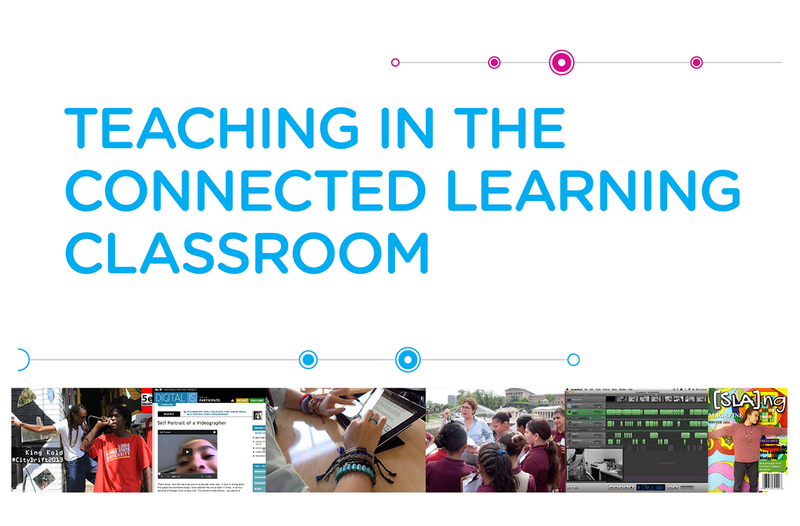 Teaching in the Connected Learning Classroom. A. Garcia (Ed.). Irvine, CA: Digital Media and Learning Research Hub. Lensmire, T. (2000). Powerful writing, responsible teaching. New York: Teachers College Press.